BATON ROUGE - Attorneys representing Alton Sterling's families updated the public on a civil case filed following the 2016 shooting. Sterling was killed in a struggle involving former Baton Rouge Police Officer Blane Salamoni and Officer Howie Lake. BRPD Chief Murphy Paul fired Salamoni and suspended Lake for three days after the state attorney general opted not to pursue criminal charges against the two. Paul said Salamoni was terminated for how he handled the encounter, adding he did not follow BRPD protocol when he confronted Sterling, nor did he exercise emotional control. Lake was suspended for failing to maintain his composure during the incident. The families announced a civil suit last year against BRPD. Tuesday morning the attorneys said the trial date is set for April 20, 2020. According to the group of attorneys present, they received documents about Salamoni which makes them believe he shouldn't have been allowed to carry a gun. 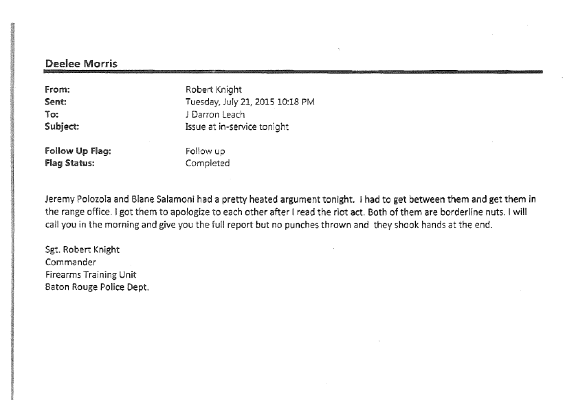 One BRPD document shows a superior called Salamoni "borderline nuts" following a fight at a gun range with another officer. That was in July 2015, one year before Alton Sterling was killed. The attorneys are planning to look into Salamoni's, as well as Lake's, training by looking through the BRPD training manual as part of the lawsuit.